In a project I’ve been working on about addressing systems in communication infrastructure (excited yet? ), I’ve been telling people that early phone numbers were organized in part around the time it took to dial them on rotary telephones. You see, youngsters, the weighted dial on a rotary telephone requires a fixed amount of time to dial each number. It’s about one second per ten values so that the amount of time goes up as the number goes up, with one being the fastest number to dial (about a tenth of a second or 1 click) and zero being the slowest (about one second or 10 clicks). These time estimates don’t include moving your fingers around, mind you. You could say, who cares? But if you add up all of the seconds required to dial and multiply by all of the phone calls, that’s a lot of seconds people spend dialing those nines and zeroes. I dimly remember seeing this in print somewhere. Here’s the problem: I’m not sure where I learned about this rotary dial influence and I had no sources. Okay, so I figured this out — and I have a source. The North American Numbering Plan of 1947 says that in the first area codes the middle digit was restricted to either a zero or a one. If the former it would route to a local exchange, if the latter it would route to a long distance trunk. It looked for a zero or a one in the middle position to identify a long distance call. Another fun fact: This whole system of area codes was used internally to the phone system by operators, not externally by users, for about fourteen years. 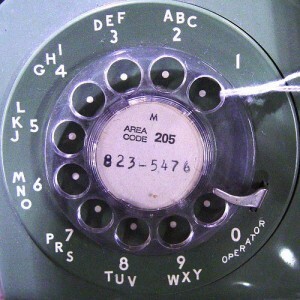 Direct dialing by users didn’t become universal until the 1960s. So the solution to the puzzle is that only the first and third digits were optimized for population density. Washington, D.C. then gets a very good number because the “2”s in “202” are fast to dial, but it gets a zero in the middle because it is a state — or in this case a “district” — that only has one area code. The engineers probably thought that the 0/1 distinction would be fine because states with population centers in them would tend to have “1”s because they would have more area codes, and 1s are faster to dial. But here is yet another example of an exception breaking a beautiful optimization plan. DC is a kind of city/state. Not really a state, but more than a city. Since it isn’t subdivided further, it gets a slow “0”. Okay all this may seem arcane, but these kind of things matter to people. Area codes and phone numbers matter, at least they used to. 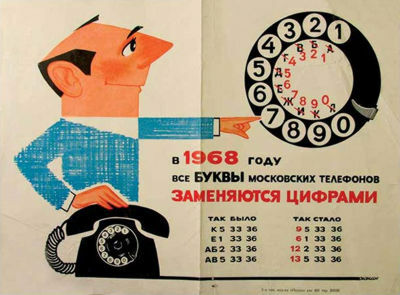 [This ad explains the shift from numbers to letters in Moscow. This long path of puzzle solving made me think about the premise beyond the seeming anomaly of Washington DC. Is it true that the original codes were optimized by dialing time and population density? Who won and who got screwed in the original numbering scheme? That is (besides Washington DC) who got the slowest or disproportionately slow-dialing area codes and who got the fastest? Any anomalies? So I made a spreadsheet and compared the dialing times to the 1940 census. It looks like the relationship is sort of true, in that the assignments do mostly correlate to population density during the 1940s, but that in addition there are some anomalies. In other words, the telephone engineers played some favorites. [Cities with the same number are equivalently slow/fast. Austin, Western Massachusetts, and Dallas. They get super-fast numbers. Why did they get these prime numbers? Austin, Texas? Come ON. I smell a payoff. Favoritism. Something. Cleveland, Baltimore, and Boston. They were given disproportionately slow numbers for their population. Although they don’t make the above list, the many citizens of New Jersey (201) also get screwed because they get a state-level code and the middle zero gives them a very slow number relative to the state’s population density. And how about the people of Charlotte, North Carolina? They live in one of the 100 most populous cities in the USA at the time, yet they are lumped in with South Dakota for the slowest area code given out in the USA (2.2 seconds). Let’s not forget our friends in Canada. The Canadians didn’t get any good numbers for their cities, even for Toronto and Montreal. Mexico joined the numbering plan later and for their trouble they were given 905 for Mexico City, the slowest area code then in service (2.4 seconds), slower than everything given in the US and Canada at that time, despite a very large population density. This just proves the adage: The poor have the worst addresses. Maybe this rough treatment is what caused them to leave the North American numbering system in disgust in 1991, even though Mexico has not left North America as far as I know. However, from everything I can determine the route numbers had no relation to these area codes. Oh well. Another possible reason for the anomalies is that it looks like they tried to choose area codes that were very different from each other for places that geographically abut each other. I’m not really sure why this would be advantageous. (Ideas, commenters?) But unlike other numbering schemes like the Interstate Highway System, similar numbers are emphatically NOT spatially adjacent to each other in the area code plan. Mostly. So California gets 916, 415, and 213. Illinois gets 217, 618, and 815. In fact, in the entire table no two adjacent numbers refer to adjacent places as far as I can tell. So the Dallas number on the chart above is sandwiched between a California and a Pennsylvania number. The Austin number is between New Mexico and Ohio. Western Mass. is between Wisconsin and Pennsylvania. So maybe that’s it? This entry was posted on Wednesday, June 9th, 2010 at 4:49 pm	and is filed under Research. I’ve got to take issue with this comment: “the telcos now ensure that Washington DC gets the best of everything.” DC was actually slower to get new services like FiOS than Virginia was… It wasn’t available on Capitol Hill when I left. Okay I admit I’ve never lived in DC. That information about new services is something I read on Harold Feld’s blog, Tales of the Sausage Factory. I know someone told me that historically they have had fantastic cable service with a lot of channels and pay-per-view options for the reasons I mentioned. But maybe not fiber. Still I swear DC and Virginia are doing pretty well compared to… say… Champaign-Urbana. Or even Chicago.